Not only has it provided peace of mind for you and Caleb day to day, but also think of the future too. He isn’t having as many highs and lows to damage other parts of his body over time. Remember the comment you made shortly after he started the CGM? You were worried about his line looking like a lie detecor because of all the bouncing up and down. Looks like you guys have things working a little better for you now. You are doing a great job, even more so now since you guys have the CGM to prove it. When we were choosing our pump, the educator said one thing to consider was if we wanted a CGM and did we want it integrated. I needed to jump one hurdle at a time and went with OmniPod for what I saw as it’s pluses. With our first visit after getting the pump, I thought we’d see a huge difference in her A1C. But I had to remember that we had only been pumping for a month at that time. Her number did go down, but of course the doctor said there is still room for improvement. I think her next visit will be the true test. I’m a numbers person, too. I wonder if having even more data would just send me over the edge! Its crazy that his number is that low and you’re avoiding lows so well! I feel as if I was a parent of a child with diabetes, I would want to keep them running a little highter – maybe 120s-130s- to not worry about the lows that they may or may not tell me if they felt. My grammar is all wrong, but I am impressed that the CGMS has allowed you to worry less about those scary lows. This will impact his life so much in a way he wont’ understand until he reaches the middle of his life and is complication free – you’re such a great mom. Ever since Brendan was diagnosed, we were always taught that the complications (kidneys, limbs, nerves, etc) later in life are due to the swings in blood sugar, the big gaps. So the more we can close those gaps, the less likely complications are. So, with that said, if having a CGM can close those gaps for Caleb and make that control more controlled, you are headed in the right direction, lower A1C or not. And hey, being a mom of a child with type 1, I would have to totally agree that anything that helps the psyche in a postive way, is good for everyone involved. I always have to remind myself that diabetes is not just a physical condition, it is an emotional, psychological, spiritual condition too. It affects the entire person and family. It sounds to me like the CGM is working for you. My entire family suffer from diabetes it is a bad disease if not taking good care of it..can cause to damage some internal organs but you can live with it just need to take madicines and watch your diet. Thank you everyone! Your comments have helped solidify things even more for me. It’s clear that to expect a numerical change to Caleb’s A1C doesn’t make a lot of sense based upon where it has been for the last couple of years. Sarah, you are exactly right – Caleb going from a liar to a truth-teller I think is why I thought there might be an improvement :). I see now that we DO have an improvement, it’s just not quantifiable in the way that I am used to. With a new depth of technology comes the benefit of a new depth of information and analysis. You guys are all great! The time you take to read and comment means so much to me! I can never thank you all enough!! I just wanted to connect with another T1 Mom. My 3 year old has diabetes and was diagnosed in February 2007. Your blog is amazing! Thanks for sharing all your experiences. It helps all of us band together and not feel alone in our journey. We are going to put in a new Dexcom sensor after a three week break. Numbers were steady and pretty good so we took a break. As of two days ago, another growth spurt so Dexcom will go back on. Best with full time use, but I believe it is fine to use half or three-quarters of the time. A1c is coming up soon, and numbers have been high past two days so time will tell if this break effects the A1c. Since our A1cs have usually been in the low to mid-sixes we did not notice a change in A1c number, but more in-range numbers means the low A1c is accurate. 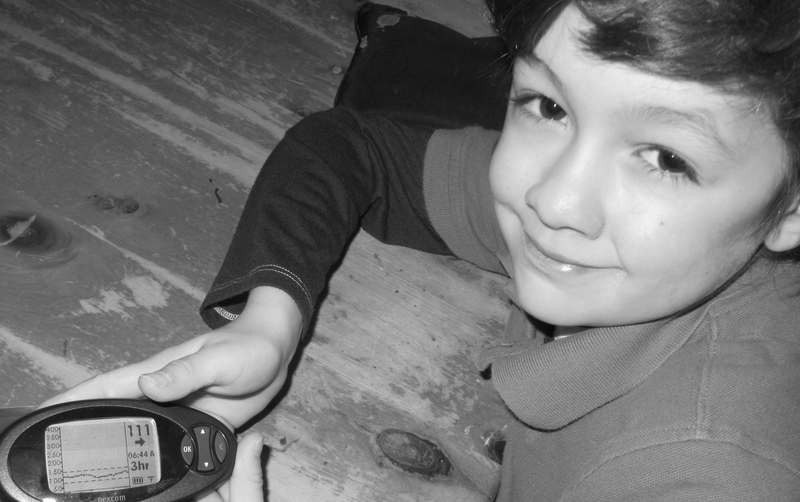 Did hope for a reduction, though; hard not to…..
Our dexcom is in the mail…my DD can’t wait.